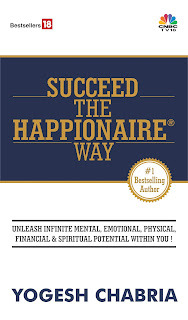 Yogesh Chabria - The Happionaire ​Blog - Best Motivational Speakers In India - Inspiration, Success: A Happionaire Shares His Ideas! A Happionaire Shares His Ideas! Our Pune event went well by the grace of God. It was great to see so many people of all age groups sharing ideas and asking questions. I could have never imagined that so many people would get interested in finance and investing. This knowledge will surely go a long way. I have got several e-mails from people in other cities, curious to know what happened. Inshallah we will be having such events across the country and ideas will be shared here too. I remember sharing my nimbu-paani story from ITHW and it was great to see a mother buying a copy of the book for her young son after listening to the story. She told me how the story was so simple that even her young son understood what the stock markets were. If I am not mistaken her son was barely 10 years old. That young boy is very lucky to have an intelligent mother who is investing in his future. With time I'm sure more young people would be empowered with knowledge and realize the power investing wisely has. If we stick to the basics, we can create wealth. However many of us simply choose to watch and listen to external noise, and thus forget the basics. Several times retail investors ask me where and how they can get information. One of our fellow Happionaires proves that information is certainly available, we just need to find it. In my last post I had told you about Mr. Rakesh Khosla and how he shared something very interesting. He suggested I share it with all other Happionaires. I got an e-mail from him after my post where I talked about L&T's growth and how we can look at companies which will benefit because of this growth. He shared a list of companies that might be doing some work for L&T or might be suppliers of some kind. Looking at this list we can find out a lot about companies that might benefit from growth in L&T. A few of these companies might even be listed and might be investment worthy. Even if you don't find an investment worthy company, you can certainly learn more about the work L&T outsources. I too am spending time trying to learn more about these companies. We should all thank Rakesh for sharing something so interesting. We can use this strategy for other companies too. Feel free to thank him and share your views in our comments section. There is a lot of information available out there, and as investors sometimes we can be over burdened with information. With time and experience we will be able to figure out what is needed and what isn't. A lot of our Happionaires also have queries regarding index funds, futures and options. I shall be sharing my views on this in my next few posts. Our last post has some interesting discussions on luck, karma and investing and I got to learn a lot. I will once again quote Rakesh on something. He very beautifully said that at the moment it is sowing season for all us investors. The markets are down (and might go lower, we don't know-nobody really knows.) and the seeds we sow today will give us the harvest in the next 3-4 years. We can all either worry now or look at this as a sowing season. What we do today, will decide our tomorrow. The investment decisions we make today, will decide our wealth in the future. Very interesting strategy Rakesh. Thanks for sharing it and yes Yogesh I am looking forward to an event in my city here in Chennai! Markets are going down and I am sitting on cash and using every fall to buy into value. I'm sure next 3-4 years we can see markets much higher. I also read your views in The Hindu alongwith Rakesh J. He is saying markets will touch 50,000 in the long term! well looking and L&T contractors I cannot figure out my chances betting on some of these companies and getting rich in five years. I need to go and visit each of them and study their business. Bit difficult isn't it. I would rather stick to mutual funds. Why don't you focus sometime on plain and simple investments like mutual funds. I think equity is not for everyone. I think people who work hard are the ones who create wealth. Stock markets need you to put in time and need you to do research and reading. If you can't do that, you should go for mutual funds. But MFs will never give you the same returns. The richest man on earth did not put his money all in MFs, he instead researched companies and picked value. If you read ITHW, you will realize Yogesh's views on Mutual Funds which I fully agree with. Thanks Rakesh for sharing this wonderful list. It is exhaustive but at the same time very informative. I agree Arpita. People fail to understand that the best investors are those who are all the time trying to hunt for information and knowedlge. After reading ITHW, I went on to read The Dhando Investor. It is another great book suggested by Yogesh and I loved it. That too has a very simple language. I found out that the best investors are those who wait patiently, as long as they know what they have invested into, even if their stock prices fall 50%. And thanks a lot Rakesh! thanks yogesh for this wonderful event, really liked your lecture here .I wish there was more time to listen to you. And one of the thing i want to say about your book is that you have presented many fundas of market with a simple story that is really good. I liked story of monkeys that you used as an example of some brokers who turn market in their way. I agree Nikhil. The simple stories make things more easy to understand and remember. I enjoyed the event a lot too and would have loved it to go on for longer. I do understand though that they had to return back. Next time maybe you should keep it in the morning or afternoon on Sunday so the day can be spent. Mind blowing - its a sheer coincidence that i was thinking about the same thing. the other day i met a friend of mine who has started a Digital Ad company and doing pretty well. He shared a strategy of reliance to get into the Outdoor ad industry by acquiring/installing flex hoardings/digital hoardings. this will in turn boost growth to my friend as he has established his mark in that area already and reliance is partnering with him in bangalore. so somebody if he decides to go public or seek investment its a safe bet as he will grow along with reliace and we all know about reliance! Thanks Rakesh for sharing such am awesome idea with us. This approcah would go a long way in sharing and growing Knowledge.. I went through the list and it seems to be quite big. That, however is not a problem. I'm not jumping into the stock market now. I am just trying to learn the skills of investing. I, however, want to know that how do we find such vital information. in this case, the investor gurus have helped us by providing the list but in case we want to find such details on our known how do we go about finding it. what can be the source of such info.? Anish- Thanks for keeping track and reading. Glad to know you noticed The Happionaire Way spreading and shared it with us. Very correctly said Arpita and Kamlesh. Nikhil, I wish we could have stayed longer because I love interacting with fellow Happionaires and I too get to learn a lot. Will surely consider the suggestion Sudhir. Hypocrite- Very interesting to know about your friend's Digital Ad Company. Feel free to share such ideas with us and I still need to figure out the mystery behind your name. Will surely check out your blog. I am glad Siddharth, feel free to share any interesting findings with us. Sweta, am glad that you are focusing on the learning part. You can learn and find such things in the public domain. For instance the financial statements will also give you details regarding creditors/suppliers. Also lately the number of e-mails from Happionaires who have read the blog as well as ITHW has been extremely high. It makes me happy to read and hear from you and know that the book helped you and made you smile. I have also got a lot of feedback and things which can be improved. Even though I might not be able to reply to each e-mail, please know that they all mean a lot and make me smile. Apologise from the core of my heart... had not seen the comments on the blog of my fellow bloggers. Having apologised, now I want to say "Thanks". I somehow had not visited the blog since the past week, today when I saw the last line of Yogesh's newsletter I have come here to read all the comments. Hence, I would try to contribute what ever little I find. This is from another board, and not my own... but very interesting and I think a must read. The other day, two school kids were talking to each other – sharing jokes and having a great time. I happened to be around and overheard the following joke. One day, a person decided to swim across the English Channel. He started with a lot of enthusiasm. He had crossed around three fourth of the channel. Tired and exhausted, he thought this was enough and he cannot go any further. So he swam all the way back. Doesn’t this sound familiar – especially for many investors in the stock markets? Why do the markets have to start rising immediately after we have sold or vice versa? Rational thinking suggests that an investor chooses to invest in the “risky” stock market securities to reap higher rewards. Reality suggests that an investor chooses to invest in the “ever-rising” stock markets after the prices have been rising for some time in the recent past. This past trend is then extrapolated into infinite future to conclude that upward is the only direction in which stock prices can and will go. In such a scenario, one tends to assume that the stock markets can give super normal returns without carrying any risk at all. The investor perceives the risk to be absent from the market and continues to pour in more and more money. Suddenly, for reasons not known to anyone, the market takes a “U” turn and prices start their southward journey. The initial response from people at large is that of denial. The situation looks like small aberration and one is convinced that the reversal will happen once again. It may or may not happen that way. And when the prices do not start moving up in a hurry, one’s patience gets tested. How long can one control the emotions in such a scenario is a function of the conviction that one has and of course the solvency. But often, more than the solvency, it is the conviction that is more important to survive in the market. Where does the conviction come from? Conviction comes from supreme confidence in what one knows and understands. What is this knowledge? If one understands this and has confidence in the economic growth, staying invested could be highly rewarding. Then comes the question of the short term movements of the prices. Someone has very nicely said that the long term is made up of many short terms. Absolutely correct, but one forgot to mention that many of the short terms cancel one another out and the remaining short terms are a part of the long term trend. It takes enormous courage to stay calm in the noise of the short term – what with ticker, media, friends, brokers, internet – giving out number of messages. It takes a lot of patience to stay balanced in such a scenario. But patience is a rare virtue. Look at the everyday life and one can see how impatient we have generally become. One of the funniest examples of impatience is what railway passengers do while nearing their destination – even when that may be the last station on the train’s route. I was once travelling from Ahmedabad to Mumbai in Shatabdi Express and had to get down at Mumbai Central, which is the last station on the route. Shatabdi starts from Ahmedabd in the afternoon and reaches Mumbai late in the evening. Soon after we crossed Borivali, the penultimate station, some of the passengers started to take their luggage off the overhead racks and from below the seats to queue up towards the door. Some left the comfort of air-conditioned cabins to stand near the exit doors. And they stood there for close to 20 minutes. I was wondering what was happening. Mumbai Central being the final station, the train was not going to go anywhere after that giving ample time to the passengers to get off the train with all the luggage they had. The train, as mentioned earlier, reaches Mumbai late in the evening and hence there is no hurry to rush for a time bound schedule unlike in the morning or during the day time. Inside the train compartment, the environment was very comfortable, thanks to the air-conditioning. Outside was typical Mumbai weather – hot and humid. And still, many gave up the comfort for no apparent benefit. What was the hurry then? But, that is human nature. And if that is how people behave in such a simple case, stock markets are a much more complicated place. Expecting patience might be asking for too much. But then, that one trait ensures you get out of the market with reasonable profits.